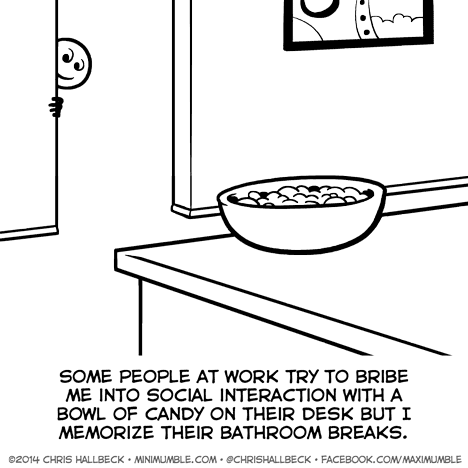 As the only employee, I wonder where the candy bowl keeps coming from. From the other side: I keep a candy bowl on my desk because I like candy and if I don’t share it then I eat it all and get cavities. I only ever expected people to stop in, grab a piece of candy, and leave without saying a word. Ever since I realized co-workers actually see it as an invitation to stay and chat, the bowl has remained empty. I tried supplying a candy bowl until they started going through the entire thing in an inordinately fast amount of time. When every other week turned into every other day, I just decided to let them get their own damn candy.